I love art and spending time outdoors, so I was very excited to hear about the first-ever Artists Paint the Town event coming up Aug. 25 in Danville, Indiana. This event, sponsored by the Hendricks County Arts Council, will give artists of all skill levels an opportunity to discover new sights in Danville, and also compete to win prizes. 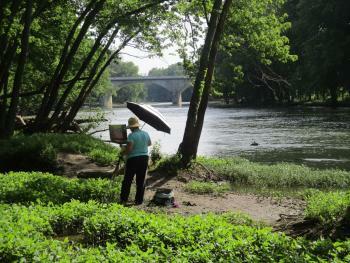 Organizers hope the event will not only encourage community members and visitors to try Plein Air Painting, or "painting in the open air," but that it will also help visitors discover beautiful and unique locations in Danville and Hendricks County. So whether you are an expert painter or you have never painted anything before, you are welcome to participate in this event. Time and Location - Artists Paint the Town is 8 a.m.-5 p.m. Aug. 25. Artists will check in at 8 a.m. at the Train Station at Ellis Park in Danville and will have blank canvasas stamped. Completed canvasas will be returned to the train station by 4 p.m. Registration and Cost - Participants must register by Aug. 18. Cost is $30. The registration fee includes snacks and a light evening meal. To register, click here. Prizes - The first place winner will receive $500, sponsored by the Hendricks County Arts Council. The second place prize is $250, sponsored by Abstract & Title. Third place is $150, sponsored by Danville Tri Kappa. One artist will be awarded the People&apos;s Choice Award. Prize-winning pieces with the artists permission will be hung at Gallery on the Square for purchase and the artists will receive 70 percent of the sale price. Supplies Needed - Organizers of the event recommend checking this website for a list of art supplies needed for Plein Air painting.